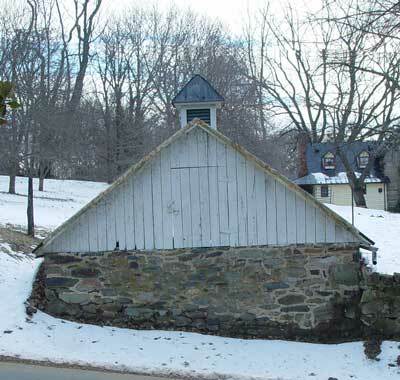 Like all towns before refrigeration, Waterford had a number of ice houses. Today, two can be seen during a walk through the village: A below ground ice house exists on Patrick Street, and an above ground ice house can be seen on Second Street. Before modern refrigeration came to Waterford, residents in and around the village relied on spring houses and ice houses to keep food and drink cool during the warm months of the year. Spring houses were not common in the town itself, as there were only a few reliable springs to work with, but many families had an ice house. I can remember at least a couple of dozen, although only a few remain today. One of the best is on the south side of Patrick Street, a well-built stone chamber about 12 feet square and as many feet below ground. A weatherboard shed above keeps the elements out. Cutting and hauling ice to stock these structures was a regular winter chore. In a hard winter any still body of water would freeze thick enough to provide good blocks of ice. If a broad, slow-moving creek or mill pond was not at hand, some farmers would maintain a small pond just for the purpose. When the ice was several inches thick and ready to harvest, it would be cut into manageable blocks with special coarse-toothed saws. My father [Jacob Elbert "Eb" Divine (1874-1966)], by the way, invented a set of giant tongs to drag the blocks from the water. The tongs were hitched to the horse traces, and the harder the animal pulled on a chunk, the tighter the device clamped. The blocks were then hauled to the ice houses and laid down with a good layer of straw or sawdust all around as insulation. Emma Myers still recalls cold lemonade in the summer-delicious despite the bits of wet sawdust embedded in the ice. In warmer parts closer to the coast large quantities of ice were routinely brought in by ship from New England and other points north. Most years, though, Waterford had no shortage of winter to produce all the ice it wanted. A local farmer recorded with obvious feeling one spell of such zero- degree weather in December 1867: "Cold all day. Very cold but thank goodness the wind has stopped blowing...Too cold to think of doing anything. Almost froze by the fire." That was not just a figure of speech. On Christmas day in 1848 Mary Reed wandered away from her house south of the village and disappeared. Her neighbors searched high and low, but it was three weeks before David Birdsall came across her frozen body on Mrs. Thurza Rice's place. January 1912 must hold the local record for bitter cold. At Clifton, an old farm just south of town, Leroy Chamberlin's wife Charlton noted in her diary on the 6th that things were freezing in the house and cellar, despite the wood stoves. On the 9th a high wind brought in still colder temperatures, accompanied on the 12th by heavy snow. By the evening of the 13th, the thermometer read 14 degrees below zero, and even heavy covering could not keep the apples in the cellar from freezing. The next morning the mercury stood at minus 25! " Went to the barns at 5:30 A.M...horses literally covered with frost. Decidedly the coldest weather that has been known here. 30 below in Waterford...."
The struggle with January continued. On the 16th, " Very high wind all night and today. Snow drafting badly. Tried to go to milk train [at Paeonian Springs] in morning. Could get only halfway-road completely closed. All the streams frozen, had to cut holes in branch for stock to drink...all stock suffering from cold. 17th...went with horses to help open roads. Three teams and about 15 men out. Assisted in cutting through about a half mile drift...reached Paeonian at noon. Brought back empty [milk] cans." There is a lot to be said for central heat, insulation and snow plows. It was another modern convenience, electricity, that eventually ended the era of the ice house-and changed a lot more besides. Service finally reached Waterford in the 1920s, provided by old Leesburg Power, and one by one families wired their houses. One of the biggest changes was in lighting. To a village long used to making candles or trimming the wicks and cleaning the sooty chimneys of coal oil lamps, the workings of electricity, and even the new vocabulary, took some getting use to. In one family, the elderly maid, on encountering her first electric lamp, tried to extinguish the light by blowing on the bulb. A more forward-thinking resident couldn't wait to "get the church electrocuted." An Essay on the Most Eligible Construction of Ice-Houses. An excerpt from an 1803 article on ice houses. 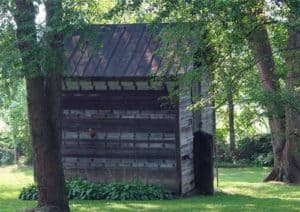 What is the most eligible construction for an Ice-house? I WILL not undertake to say I am fully prepared to answer this question; although I am persuaded that the fore going statement of the principles on which it depends is correct, and the observations founded thereon are corroborated by experiment as far as I have had opportunity of attending thereto. Yet I have no doubt but further experience will suggest to intelligent observers, improvements which do not now occur. I will however offer a plan the most simple and cheap that I have yet thought of consistent with the principles laid down. THE most favourable situation is a north hill side near the top. On such a site open a pit twelve feet square at top, ten at bottom and eight or nine feet deep: Logs may be laid round the top at the beginning, and the earth dug out raised behind them so as to make a part of the depth of the pit. A drain should be made at one corner; the spout to carry off the water should descend from the pit except a short piece at the outward extremity which ought to rise thus, the depressed part will always stand full of water and prevent communication with the external air. Dig holes in the bottom of the pit and set therein four perpendicular corner posts and an intermediate one on each side; let the insides of these posts form a square of eight feet in the middle of the pit. Then in order to avoid dampness from below, cover the bottom three or four inches deep with dry sand, if it can be conveniently got. The next thing to be done, I consider as the most material and also expensive part of the business; which is fixing a proper floor for the ice to rest on. In order to do this, let three or four sleepers supported at the ends be placed across the square included by the posts; their upper edges about a foot from the bottom, but so that the plank laid thereon may have a descent of a few inches towards one of the sides next the drain. The plank should be two inches thick and about half seasoned; jointed, grooved and tongued or lathed and grooves cut near the joints, in the upper side so as to prevent any water from going through. The floor must extend a little without the inner sides of the posts; so that the water dripping from the sides may fall on the floor. Then fix a plank, or spout at the lower end of the floor in such a manner as to convey the water into the drain. The floor being completed, begin at the bottom and plank up on the insides of the posts with 3/4 or 5/8 plank, lapping the lower edge of each a little on the one below so that the water may be kept on the inside: this done to the top of the posts (which should be even with the top of the pit) and the inside will be completed; except that it will be proper to cover the floor with loose plank previous to putting in the ice. The roof may be composed of any materials, and in any form that will defend the contents of the pit from wet, from the direct rays of the sun, and also admit a free circulation of air: I do not think any could answer the purpose better than one made of thatch, supported by posts a few feet from the ground. THE mode of filling the house remains now to be considered; and on this much depends. EARLY in the winter fill the interstice between the ice chamber and the bank with clean dry straw closely pressed; this being done early, will prevent the earth from freezing; which would be injurious to the sides of the pit. The ice should be collected in the coldest weather; let it be exposed at least one night to the cold atmosphere after it is removed from the water; which will reduce its temperature many degrees, if the weather is severe. When put into the house, it should be beat small, and I think it would be useful frequently to sprinkle it with a watering pot whilst putting in; the mass would by that means be rendered more compact. When the chamber is filled, cover the whole with a good thickness of straw; but I should suppose it would be best to cover the ice first with plank, supported by the sides of the chamber, only leaving a door to descend through. SUCH a house as has been described will contain about ten ton, and I am persuaded will be found sufficient to afford an ample supply for almost any private family. THIS is nearly the kind I had in view when I estimated the expense would not exceed twenty dollars: and if we calculate on a great part of the business being done by the family; which in the country in general, it very well may: the actual out lay, in many places need not be five dollars. Those who are less sparing of expense, if they choose, may wall, or what is better, plank up the sides of the pit; and finish the roof in a stile of elegance. IN level situations, where a drain cannot be conveniently dug out from the bottom of the pit; I should suppose it would answer very well to enclose the ice by a mound raised entirely above the surface of the earth, through which the water may be discharged; in other respects to be similar to the foregoing description. This perhaps would not be quite so cool a repository as if under the surface of the earth; unless the mound was very thick; but I am persuaded that the loss of a few degrees in temperature bears very little proportion to the advantage resulting from dryness. IF it were certain the floor would be perfectly tight, the passage of heat to the ice would be rendered still more difficult by confining a quantity of dry ashes, sawdust, straw, or some other nonconductor between the floor and the bottom of the pit.